I hope you’ve finished all your embroidery blocks, because I’m finally back with the instructions for the pieced blocks and the setting that finishes it all up! Can you believe it? Focal print: 1 1/4 yards. This is used for the outer border and the centers of the pieced blocks. Red tone-on-tone print: 2 yards. Used for the star points, half of the setting triangles, and the binding. White background: 2 yards. Used in the blocks, and for the embroidery base fabric. Blue print (where I used the argyle one): 1 fat quarter. Used in the blocks only. Pink print: 1/3 yard. Used in the blocks only. Blue paisley print: 1 1/4 yards. Used for half of the setting triangles. You can also click any of the links in the sidebar under the 1953 Quilt-Along to get more information at any time. I’ve made this into a downloadable file just like all the embroidery blocks, so you don’t have to hover near the computer to follow the instructions. Just print them out and take them to your sewing aerie — much easier! Download the final instructions here: Hazel’s Summer Wildflowers Setting. I did not include any information on how I quilted my quilt, because I haven’t quilted it yet! But one of these days I’ll get it quilted, and I’ll blog about how I did it then. There’s also one more bonus project featuring Block 6 that I have yet to post, so stay tuned for that. 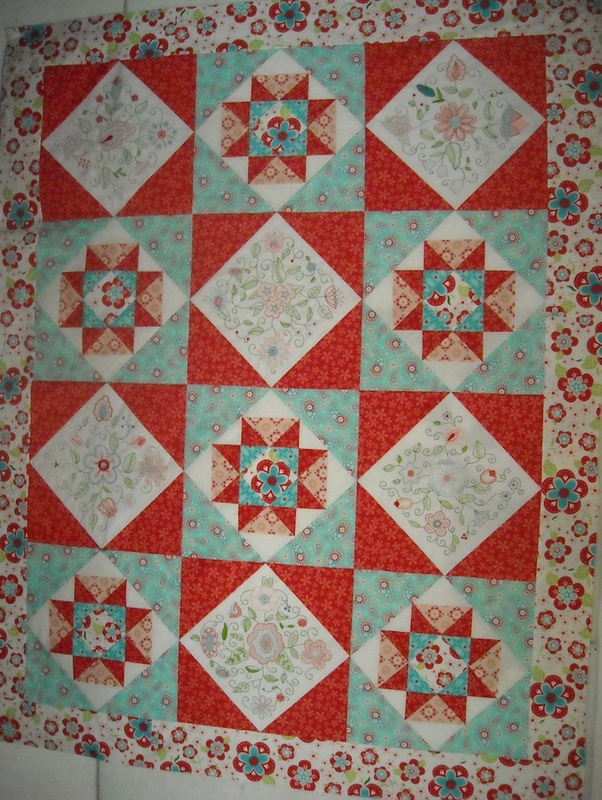 I would love to see your quilts when you get them finished, so please send me pictures or blog links. I’d be happy to feature them here on the blog, too, so don’t be shy! Now that we’re finally finished with this quilt-along, which was never supposed to take this long in the first place, I’ll be back in a few days with news about what will be happening next here on the Hazel’s Diary blog — things like more quilt-alongs (that won’t be nearly so strung out, I promise), a line of patterns, continued diary entries (yes, the story continues! ), give-aways, more recipes, stories, and much more. So keep checking back! I am looking forward to a new quiltalong. 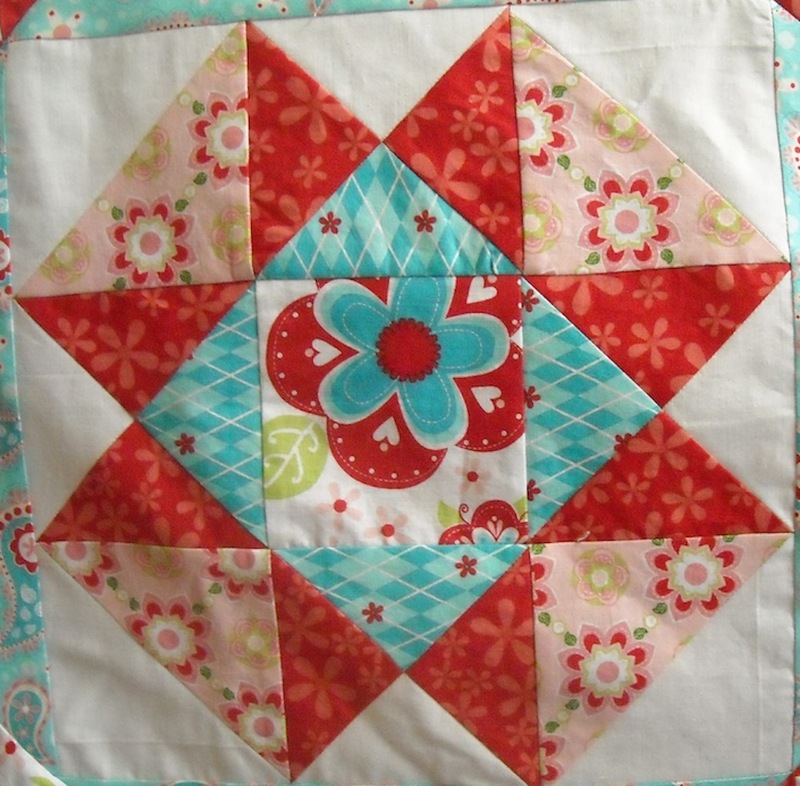 I get so many compliments on the first Hazel Ilene quilt but I haven’t joined the last few. It is time to get back in the saddle again. I check in every week and can’t wait to see what you have in store. I also miss the diary! I’m on my fifth block (all black thread on white fabric) and will have to give some thoughts to finishing this. Thanks for doing it! Thank you very much Shelly, looking forward to putting it all together.Your quilt looks great.